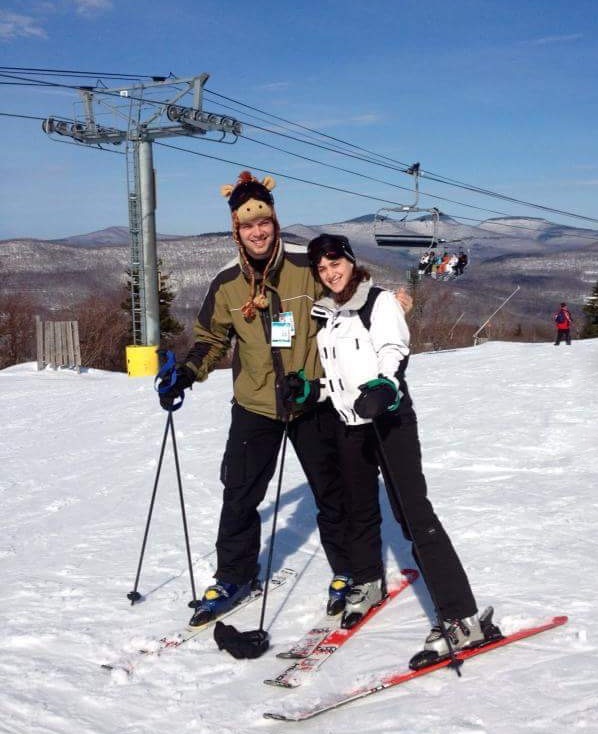 Five years ago, in March of 2013, I took my first spin on skis at Hunter Mountain. I spent two days tumbling in slushy spring snow, working my way from the bunny hill to the summit. Finally, on the last run of the second day, I took the Kaatskill Flyer to the top of the mountain and skied Belt Parkway all the way to the base. I was hooked on skiing, and I have since skied over 120 days since, progressing from faceplants on the beginner slopes to confidently skiing steep western bowls and icy east coast moguls. Every visit to Hunter is a nostalgic trip down memory lane, revisiting the snowy Catskills slopes where I first fell in love with winter. When I saw that the Catskills were poised to receive 6-8 inches of snow on Tuesday, I planned to head up to Hunter for what I hoped would be my first powder day of 2018. Unfortunately, as has been the case for seemingly the entire season thus far, the incoming storm fizzled out and the bullish forecast of 6-8 inches turned into a depressing dusting of snow. My mind was already set on skiing though, so I set my sights for Wednesday and hit the road before dawn. At the beginning of my journey, I was pleasantly greeted by an enormous blue moon that lit the typically pitch-black Palisades Parkway north of my house. When the moon set beyond the horizon, it yielded to a beautiful bluebird day, which is something in the midst of a dreary, gray northeastern winter. I arrived at the lodge and booted up in time to meet up with my buddy and fellow NYSkiBlog writer, John, for the sixth chair up to the summit. Conditions were variable depending on which route we chose. Annapurna and Racer’s Edge, normally two of my favorite trails at Hunter were slick. However, trails like The Cliff and Clair’s Way that were under the snow guns overnight, were soft and silky, and they only improved as skier traffic chopped up the snow over the course of the day. I would normally describe myself as a “wanderer,” electing to fully explore a mountain rather than taking multiple runs down the same few trails, but the superior conditions on these freshly coated slopes warranted multiple laps and offered a great opportunity to work on my technique. The contrast between the trails that received fresh manmade snow versus those that hadn’t revealed just how important good snowmaking is for turning Mother Nature’s lemons into frozen lemonade. 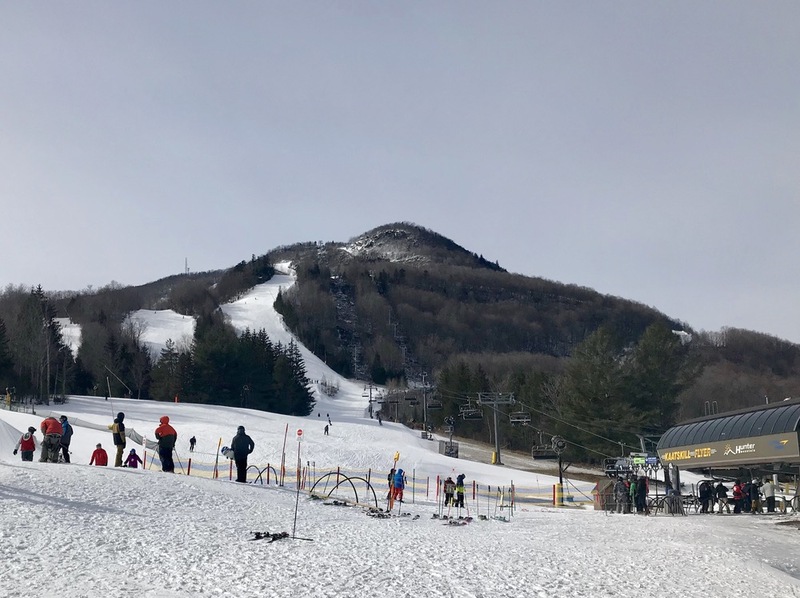 Hunter’s relatively modest footprint combined with it’s immodest snowmaking capacity makes the resort distinctly resilient in the face of difficult weather when compared to competitors. We took a few runs with Hunter’s Daniel Kenney, and asked about the resort’s proposed expansion for next season. 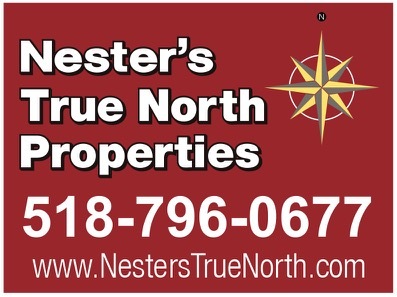 Hunter is aiming to improve their offerings for intermediate skiers and riders by adding new trails on the north side. Another new high-speed sixpack lift would provide access from the base of the new trails to the intersection of Belt Parkway and Way Out. The combination of expanded intermediate terrain and additional acreage should disperse weekend crowds and significantly improve the experience that Hunter offers, especially on weekends and holidays. When comparing mountains within day-tripping distance of New York City, Hunter is a great option thanks to its steep, unique terrain and its fast detachable lifts. And in the face of poor weather, Hunter’s impressive snowmaking shines. 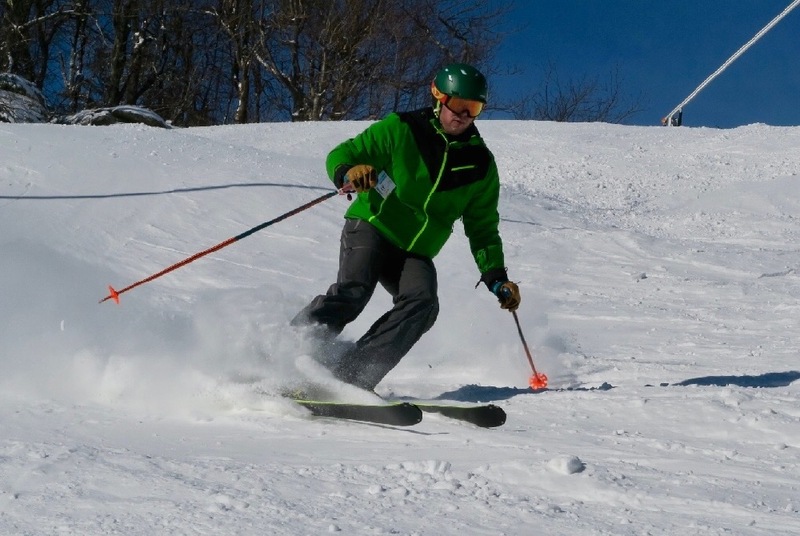 We are all eagerly awaiting the return of snowy weather in the region, but in the meantime that there are plenty of great turns to be made at Hunter Mountain. Thanks for the trip down memory lane, I will always have a soft spot for Hunter and an empty midweek day on Clair’s sounds like the best thing in the world right now. You and John are sure catching up for lost time despite the late start in your ski careers. Cheers. Nice piece on Hunter. I cut my teeth there too – as a native NY’er it’s definitely the best place around in less than a 3 hour drive. Love Belt Parkway too – not like the same named road I so despise. Lol. Would love to hear more about the planned North side expansion if you have more info. Since Peak Resorts took over, the amount of snow made is nowhere near what the Slutzkys put out. It is no longer the snow making capitol of the world and never will be. They make more than they ever have. I disagree with the previous comment. You also won’t find anything as steep going north until you hit killington. Wow, I disagree with what S says. I found that the old regime was quite hesitant to make snow unless they had a strong long window of cold days, Peaks seems to jump on every opportunity, last week there was rain, a day or two of cold and then a warm up. During the short cold period Peaks fired up the guns. I never remember the Slutzkys doing this. I do know some of the local workers have told me the Slutzkys were more aggressive snowmakers but I honestly didn’t see that in the last few years of their administration. It may just be a case of nostalgia for a time when we were all younger. I haven’t been there for a few weeks, but I think Slutzkys use to make more snow, especially when there are extended periods of cold like it has been this year. I know many trails, the snow would have been almost as high, if not higher as the fence that lines the side of the cliffs. 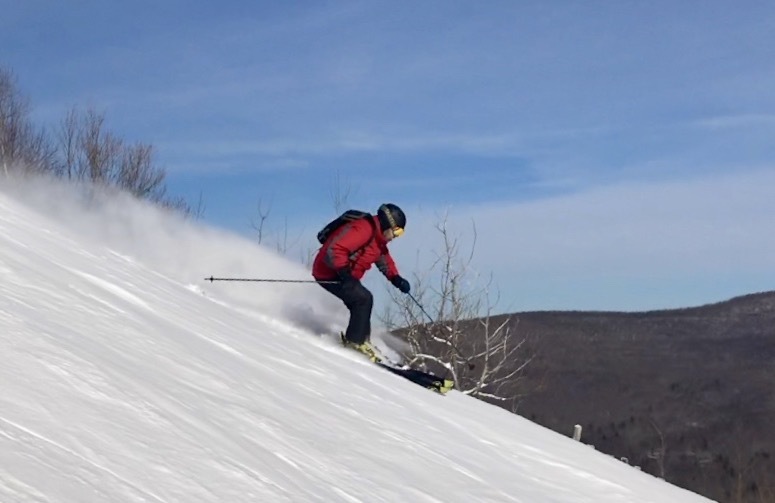 It was always kind of a pet peeve of mine, since that puts me off from skiing too close to the edge, and with relatively narrow trails like the Cliff, you need the whole width in order to ski relatively cleanly with GS skis. Hunter is getting 8 – 12 inches today. Also yeah, you won’t find anything as steep as Lower K27 or westway until you hit Killington. 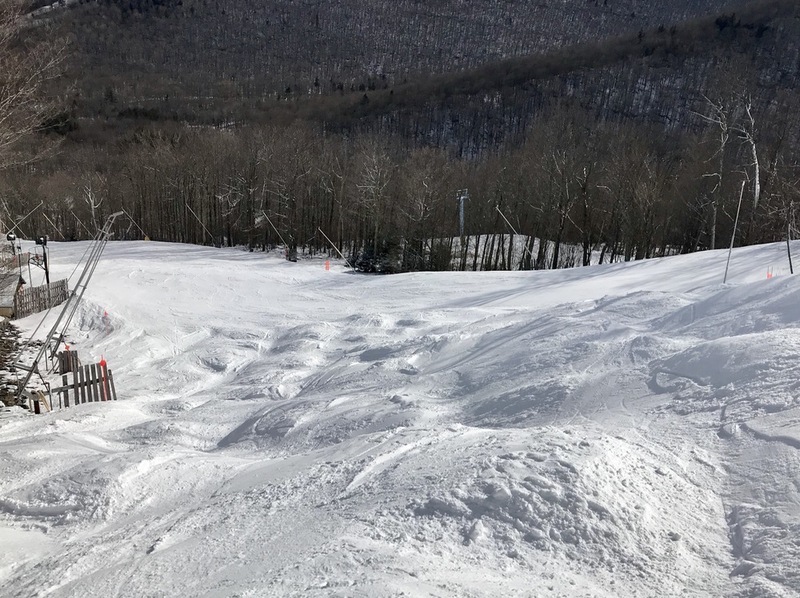 Lower K27 is insane because the top of it usually has 10 – 15 foot high snowmaking mounds, making for the drop in similar to dropping into a western bowl. And then it is 44 degree moguls for about 350 feet.